During difficult times it is especially important to remember that God is with us, cares for us and provides for us. The early church encountered their own “storms” but God continued to work in people’s lives as they gathered together for meaningful meals, with joyful, sincere hearts while praising God. 1.​ Social | Connect around the table by having conversations with one another ​instead of being on the cell phone or watching TV. 2. ​Special | Make a plan to gather with others, recognize the meal and time ​together as a gift and be grateful. 3. ​Spiritual | Thank God for His provision and His presence by praying at the ​beginning of your meal. In the midst of the storms of life we can rediscover the power of meaningful meal times. God can actually use meal times to transform our lives and those around us. 1.​ Storms cause fear and uncertainty. Talk about your fears and encourage one ​another to remember that God loves us, God is with us and God takes care of ​us. 2.​ What are you thankful for today and how is God helping you through the ​storm? 3.​ Pray for God’s protection and peace and thank God for His provision in the ​midst of Hurricane Harvey. For more information about what you can do to help in response to Hurricane Harvey go to Kingsland.org/hurricane-update. Happy Mother’s Day to all the mom’s out there! This Sunday Pastor Ryan taught out of the book of Ephesians. We looked at what it means to honor our mother’s. Below are some great points of how we honor our parents. Childhood Obedience- In Ephesians 4:1-4 Paul was talking to children. One of the ways that we honor our parents is through obedience. The reason for this is when we obey our parents we are also obeying God, because he commands us to obey our parents. Generational Appreciation- We should honor our parents and specifically our mothers today regardless of age. Whether we are adults or we are children, we should honor out mothers because it is Biblical and they are worthy of honor. Social Order- The family structure and the measure to which we honor our parents and submit to their authority becomes the barometer of the rise and fall of nations. Honoring our parents has enough significance that it effects everything in our society. Listen to Her- Listen to your mother; it speaks so much value into her. Respect Her- Give her the honor that she is due. Protect Her- Take care of her and make sacrifices for her. Thank Her- Write a letter to your mom thanking he for all that she has done for you. Why is obedience to parents difficult? How can you bless and honor your mother today? There is power in giving a blessing. In the Old Testament, the term blessing means “to bow the knee” or “to show honor.” It also means to add value, as in adding gold coins to the scale. To bless someone is to show gracious kindness or to give honor by intentionally ascribing God’s promise to another. A. You need a blessing. You were made to experience a blessing. B. You were created to bless. Be imitators of God. Mirror God by blessing others. • What is the difference between a compliment and the blessing? • Did you receive a blessing when you were a child? Add value to those at your table (or those around you). Bless them by ascribing a promise of God. Affirm a trait or quality you see in them. Bless them. 3. Parents or an older person who has impacted you. Randy Phillips, our guest speaker, focused on seeing our life and ministry as an “open table” to those around us. God is calling us into ministry with Him and through the understanding of the power of the cross as believers, our focus turns outwards to invite those around us into His grace and love. Exodus 12:4 says, “If a family is too small to eat a whole animal, let them share with another family in the neighborhood.” Through this scripture and also looking at the parable of the Good Samaritan, we learned to look forward with ‘harvest eyes’ and be compassionate and loving to those around us. The phrase “too much lamb for my house” prompts us to question what we are doing in order to reach other people for the gospel at our tables in our homes. When we start to see our neighbor as Jesus does, it radically changes the way we live and love. These are people who may be prospering, highly educated, affluent and can also be the biggest challenge of those to reach. These are people who are completely open to the concept of needing something bigger than them. Easiest people to tell about Jesus because they are looking for answers. ● What actions can you take to have an open table in your home? Who can you invite to dine at your table? ● Discuss what it means to have harvest eyes? Do you have harvest eyes? ● What does it mean to have “too much lamb for my house”? ● Think of people you may know that fit into one of the four categories of lostness and talk about ways that you can reach them for the kingdom. Scripture tells us in 1Timonthy 4:7-8 to be active in spiritual training. Spiritual training is essential for us to grow closer to God and the table is an awesome place to train. Discuss the attributes of God while sharing meals this week with your friends and family. For example, talk about the faithfulness of God in your life or how God’s forgiveness has changed your life. Continue your conversation at the table by encouraging one another in God’s promises. For example, what does God’s Word tell us about how to view a challenge we are currently facing in our own lives. After talking about the attributes of God and the promises of God discuss how to follow God by practicing obedience. Look to scripture to find direction and ask the Holy Sprit to help you be obedient. The key to effective spiritual training is the order in which we train. If we start with seeking knowledge and trying to practice obedience before receiving the grace and love of Christ then our training becomes religious and prideful. Starting with trying to know more or trying to obey God pulls us away from God. Receiving God’s love and grace grows us closer to God and makes us spiritually stronger. What adjustments do you need to make in spiritual training? Does your training begin with looking to Christ or does your training start with seeking knowledge and practicing obedience? ● Talk about this question around the table with your friends/family this week. Allow God to use this question to restore the table! Our goal of spiritual training is to become passionate in our love for Christ. As we look to Christ for true fulfillment, seek to know the promises of God in His Word and practice following Him we grow spirit stronger and look more like Christ (Ephesians 5:1-2). Studies indicate that the frequency of family meals have declined by 33% over the past 20 years. Studies also show that children are more well-adjusted when families eat together at least 5 times a week. 1. Identification — In Psalm 34:8 we are told to “taste and see that the Lord is good.” In the Old Testament, the people ate animals that were sacrificed to God. In the New Testament, the Lord’s Supper was a way to identify with the death, burial, and resurrection of Jesus. 2. Connection — Food provides opportunities for fellowship. According to Acts 2, meals played an important role in making and strengthening connections with others. Jesus shared many meals with those He met, including sinners. These meal times provided an opportunity for Him to express interest in others and to speak into their lives. Fellowship is a key component of meal times in many cultures around the world. Our culture is different in that we tend to eat quickly instead of seeing meal times as opportunities for fellowship with those seated at our table. 1. Social — Meals should be technology free and give us a chance to really interact with the people seated around the table. ● What steps can you take to make your meal times technology free? 2. Special — Don’t confuse special with elaborate. Special simply means the meal time should be set and regarded as a priority regardless of whether it is at breakfast, lunch, or dinner. 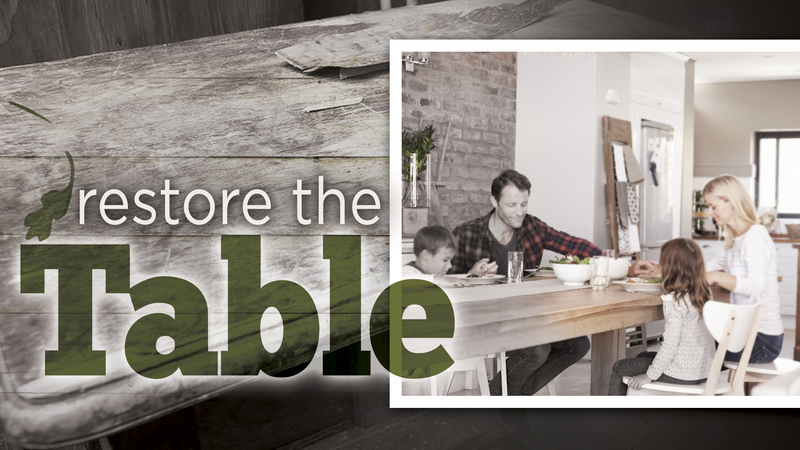 ● What is the best time for your family to consistently come to the table? 3. Spiritual — Meals in the days of the early church involved praising God. ● How can you lead those seated around your table to give praise and thanks to God? It’s time we reclaim the table! Pastor Ryan challenged us to have 5 meaningful meals together each week over the next 6 weeks. Meals don’t need to be at home, but they do need to be social, special, and spiritual. New Faith Talk cards are available at Kingsland. These cards provide prompts that can lead you to have meaningful conversations with those seated at your table. Revelation 3:20 says, “Here I am! I stand at the door and knock. If anyone hears my voice and opens the door, I will come in and eat with him, and he with me.” Sharing meals is important. Let’s start now to Restore the Table!